The types of spectacle lenses can be mostly thought in terms of single vision, bifocal and varifocal lenses. Single vision are mostly used for general use such as for simple reading or distance spectacles. However, for most people who need reading spectacles, the spectacle lenses that give good reading vision will blur things in the distance. You are therefore faced with continually putting your spectacles on and off. The amount that you do this tends to increase as you get older. Bifocal and varifocal lenses get around this by giving good distance vision through the top of the lens, and reading through the lower part of the lens. Therefore avoiding the constant on and off bit! Bifocal lenses have a line dividing the upper and lower parts of the lens, varifocals merge from one part to the other giving you middle vision too. Bifocal and varifocal lenses are available in a number of different designs and to some degree, qualities. Varifocals, in particular, have gone through a lot of development changes over the last few years. The newer designs generally having wider and smoother vision areas within the lens. of varifocals. There is often a wide range of prices for varifocals. Due to the better optics, improved adaption and being generally available in a wider range of materials, we tend to recommend using the newer lenses where possible. The most innovative Varifocal is named the X4D lens, these spectacle lenses are individually manufactured according to each users physiological needs taking lots of different measurements .By identifying your dominant eye we are able to personalise your lenses to give you faster reaction time. The differences between each eye are taken into account to guarantee maximised fields of vision. The structure of the lens is completely re engineered to ensure you feel more visual stability when moving, (less swim and sway). 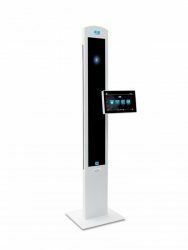 By using an extremely high tech piece of equipment called the Visioffice, supplied by Essilor we are also able to also measure your eye rotation and near visual behaviour. We now have a vast array of materials to choose from for spectacle lenses, each with particular benefits for the wearers. Ordinary plastic lenses are still probably the most commonly used. They are fairly light, safe and cheap with good optical properties. However they can become quite thick and heavy in higher prescriptions. Higher index materials allow the lenses to be made lighter and thinner than ordinary plastic. They do become more expensive as the index increases and they benefit more from anti-reflection coatings (see later). Lenses that change colour in sunlight are known as transitions. These have been available for many years, originally only as glass lenses (one of the most common names being Reactolite lenses). However over the last 10 years or so these have been largely superceeded by new plastic options. These are much lighter and safer than the original glass option. They have also improved considerably over the years, reacting more quickly, starting lighter and going darker than the original plastic lenses. They are now also available as thinner lenses and varifocals. Introducing Eye-Sun Protection factor E-SPF 25. Protect your eyes today as you protect your skin. We are now able to offer you lenses with UV cover on your clear lens. UV rays can be very harmful to the eyes and the skin around them in all light conditions.They can accelerate cataract formation and other eye and skin conditions that can seriously damage your vison and health. No glare lenses has a coating applied to a lens to reduce the reflections from the front and back of the lens. The benefit being found particularly for night driving, office working and generaly improved optics of the lenses. For example you would never find a good camera or binocular lenses without these coatings. They are particularly helpful on higher index lenses where the reflectivity of the material is greater. UV light and Blue-Violet light is present everywhere. Outdoors, whatever the weather and indoors through low energy light bulbs, tablets, smartphones and computers. Protection is recommended all day, all year long. A Blue light filter lens may help prevent premature eye aging by selectively filtering out harmful light. Wearers of polarised lenses clearly express higher satisfaction vs the ones wearing just tinted lenses, especially on vision quality, protection against glare and truer colour perception. They fully eliminate blinding reflection. Polarised sun lenses are recommended for outdoor activities, whatever the season.